Ortus Films / General Film Distributors Ltd. 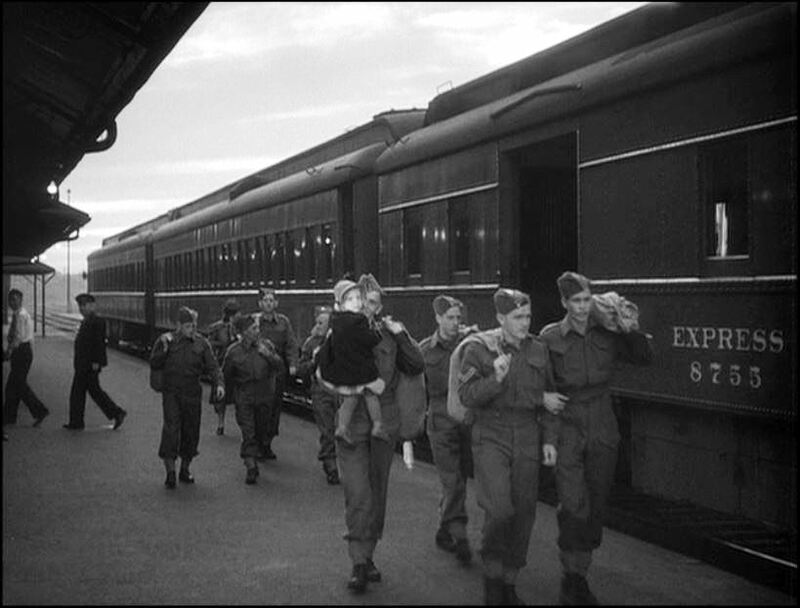 This star-studded British propaganda movie filmed at the start of World War 2, features steam trains as well as Canada’s magnificent scenery. 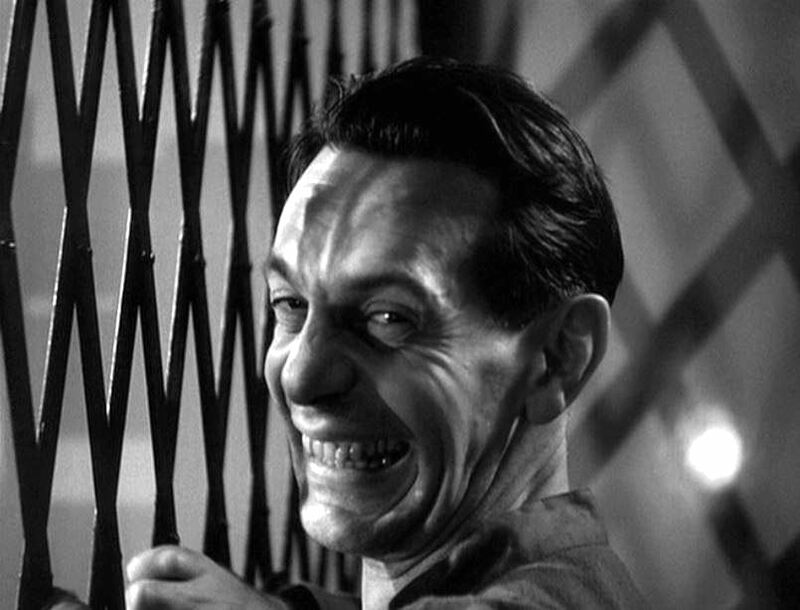 The picture was a gentle nudge to Americans (not yet in the war) that THIS is who they would eventually fight (Germans/Nazis on the loose in Canada. This could happen to you!). 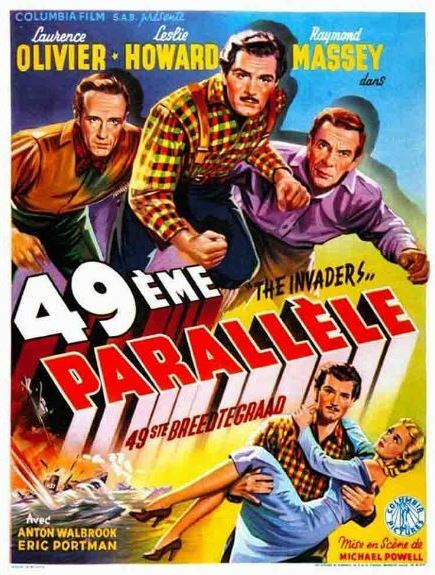 I just LOVE the above French poster with the two-fisted Leslie Howard, Laurence Olivier and Raymond Massey all ready to duke it out with The Hun. 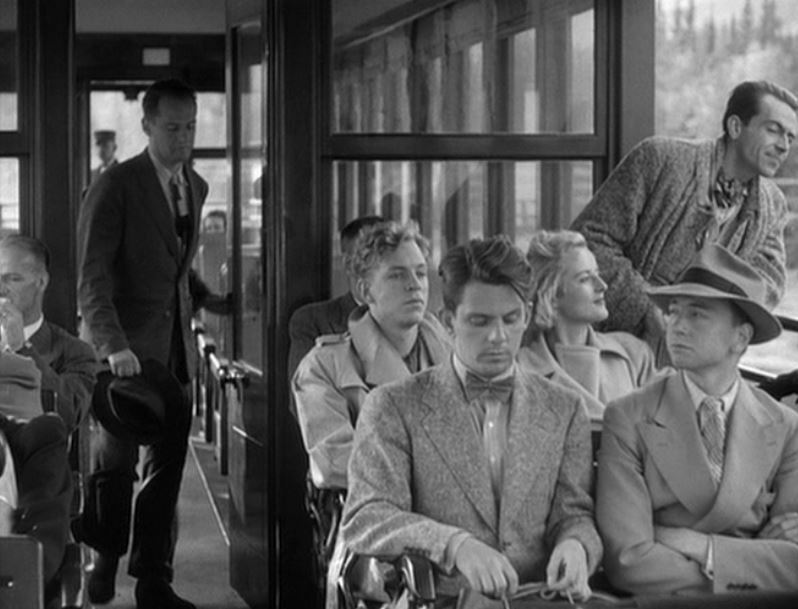 Unfortunately, the image of Olivier toting the bare-shouldered, blonde bombshell is pure fiction as there’s no such scene in the movie. Pity. 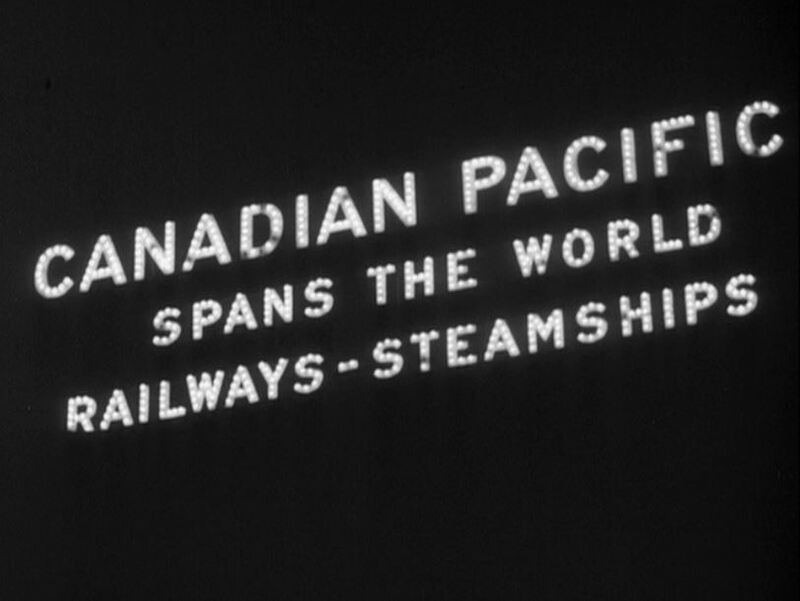 Both Canadian Pacific and Canadian National Railways make screen cameos including the climactic scene at Niagara Falls. 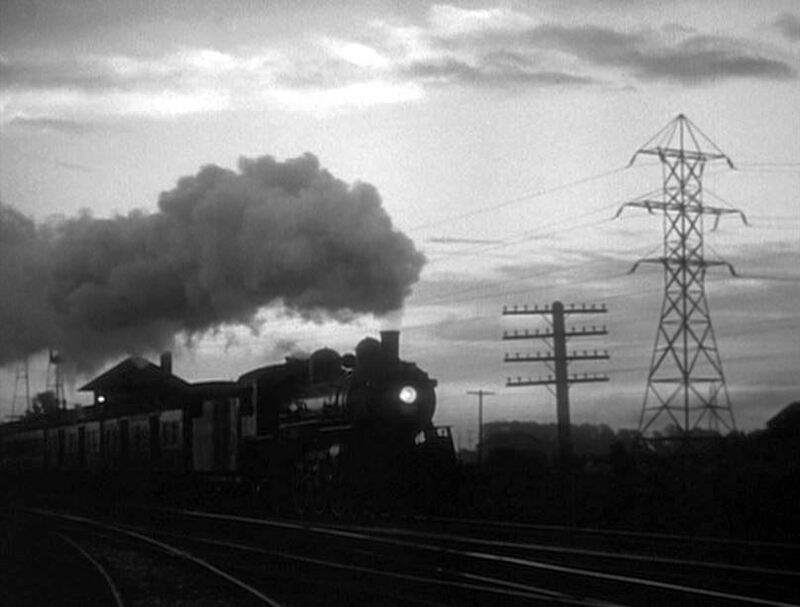 Let’s take a peek at some obscure train action in this entertaining flick! 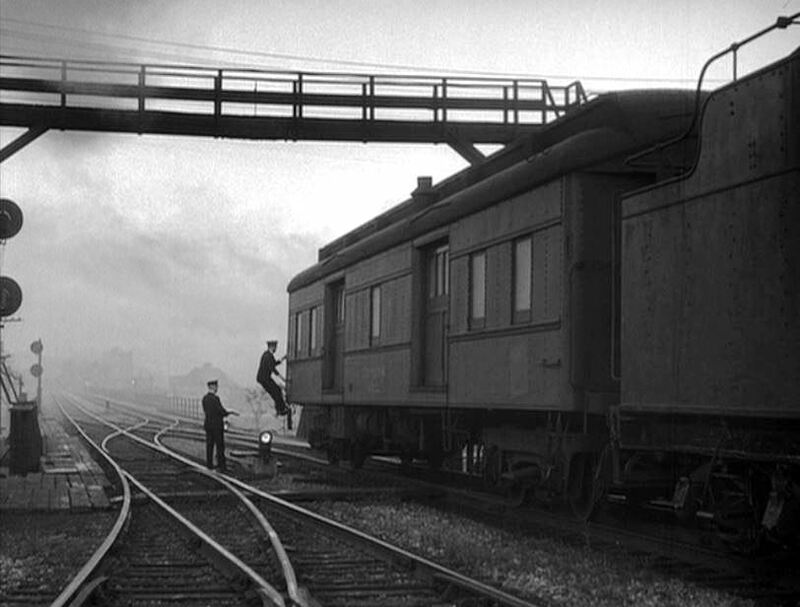 CNR subsidiary, Grand Trunk Western #5607 blasts under a footbridge with its one baggage car. 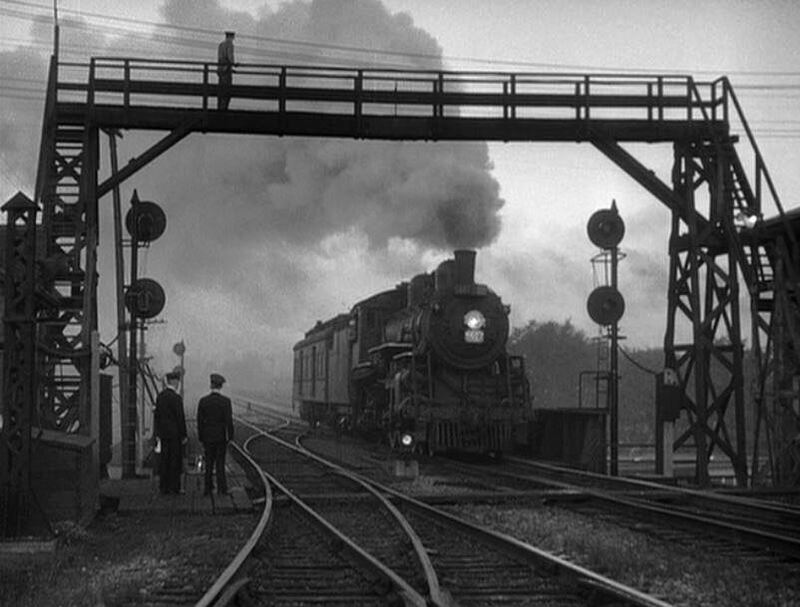 Destiny awaits the adversaries on board as the short train crosses into the United States. 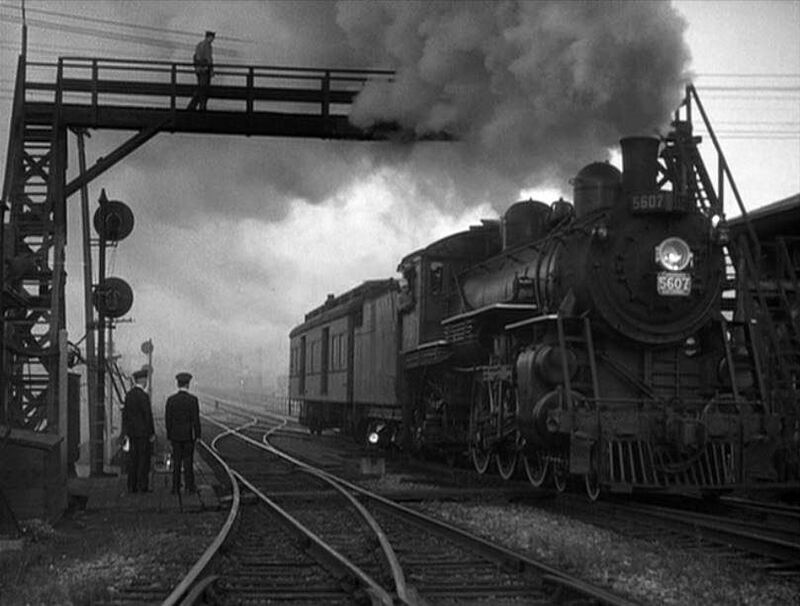 The first “railroad” scene doesn’t occur until 77 minutes into the movie. 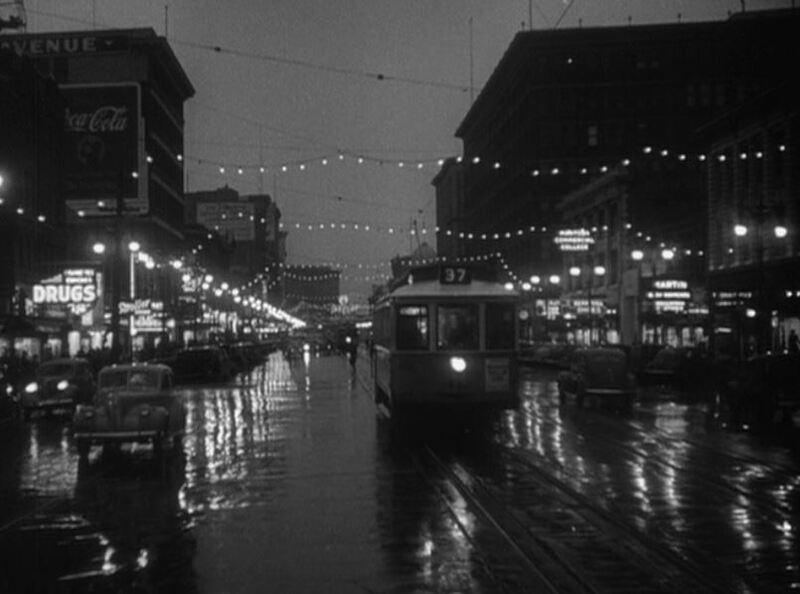 Here we see a neon CPR billboard with their famous “Spans The World” slogan; On a rainy night in Winnipeg, a streetcar on line #37 ambles down the boulevard. 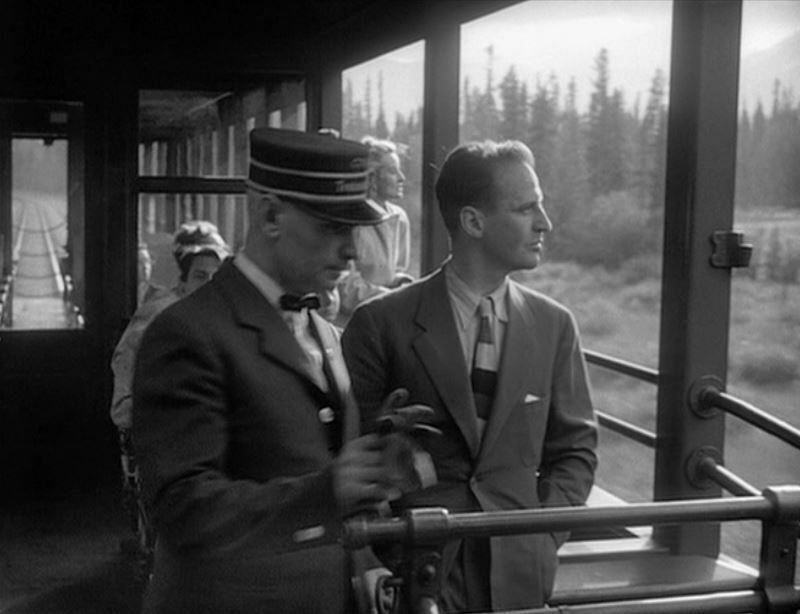 Our next railroad scene finds a CPR train rounding a curve along the Bow River in Alberta; Back in the observation car, the fugitive Lieutenant Hirth (played by Eric Portman) makes his way into the open-air section. 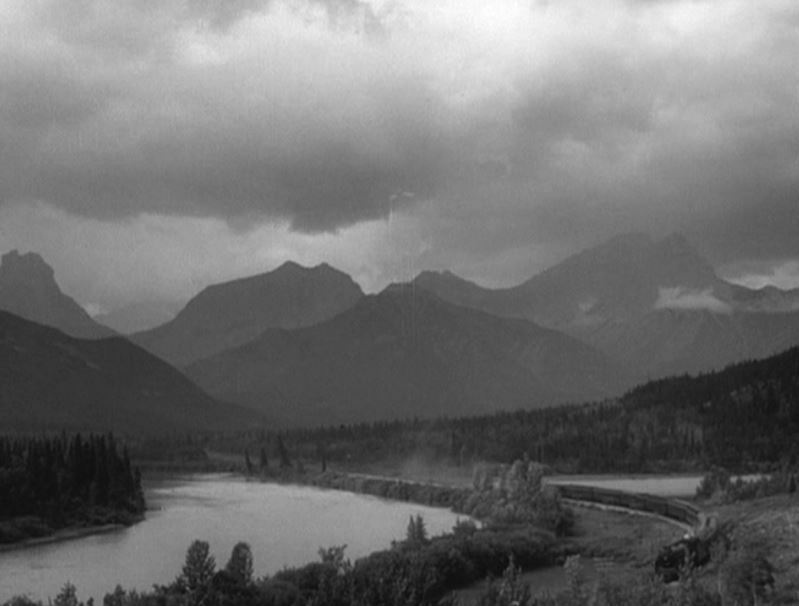 At Milepost 58 (miles from Calgary, perhaps?) 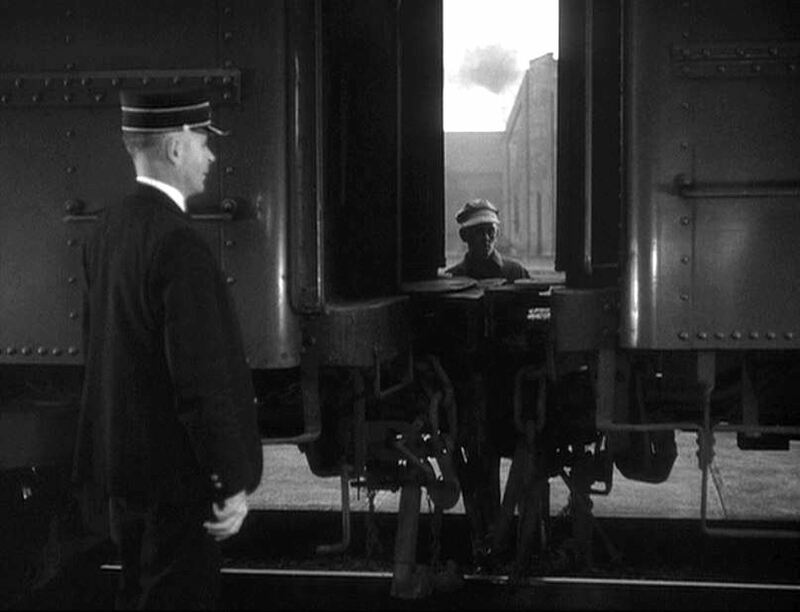 the train rolls along as the CP conductor chats up Hirth. 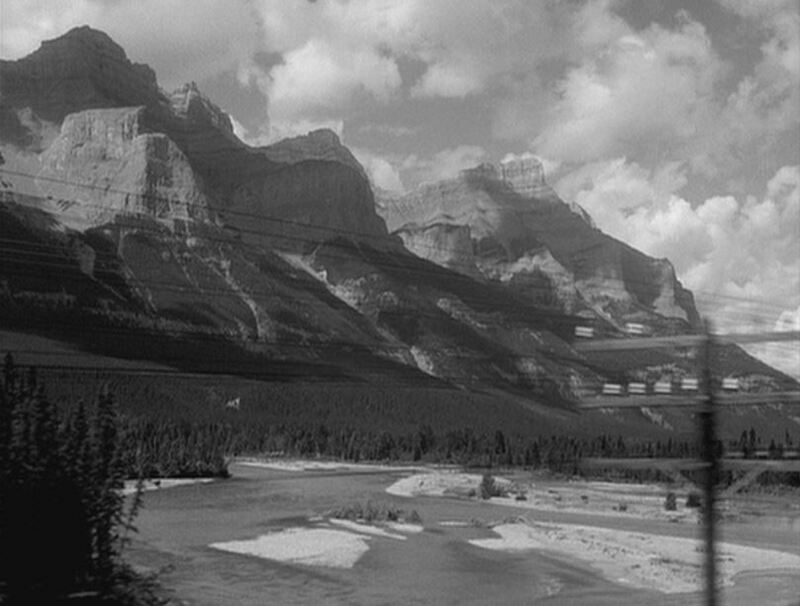 The conductor points out the Three Sisters Mountains, telling Hirth they are “in The Park now”. 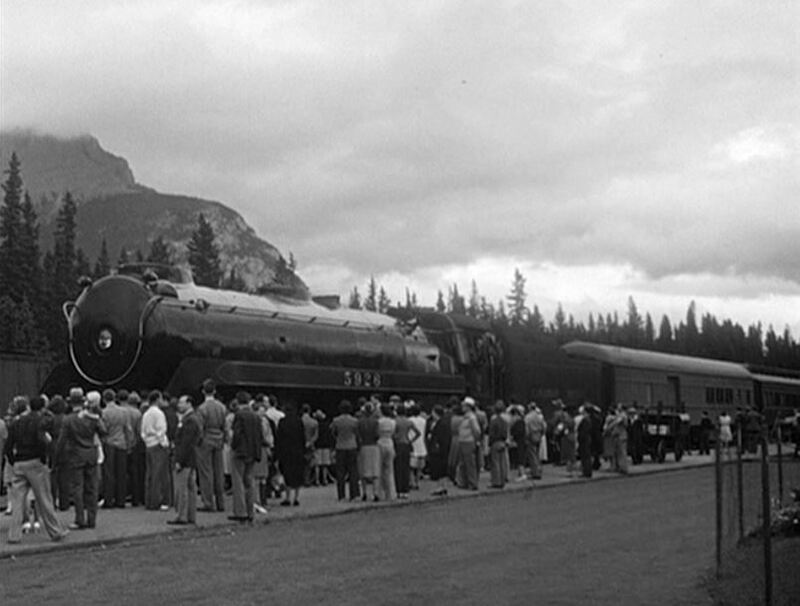 As the train arrives at Banff, we get a good view of CP #5926, a Class T1b, 2-10-4 Selkirk Type built in 1938 on the point. 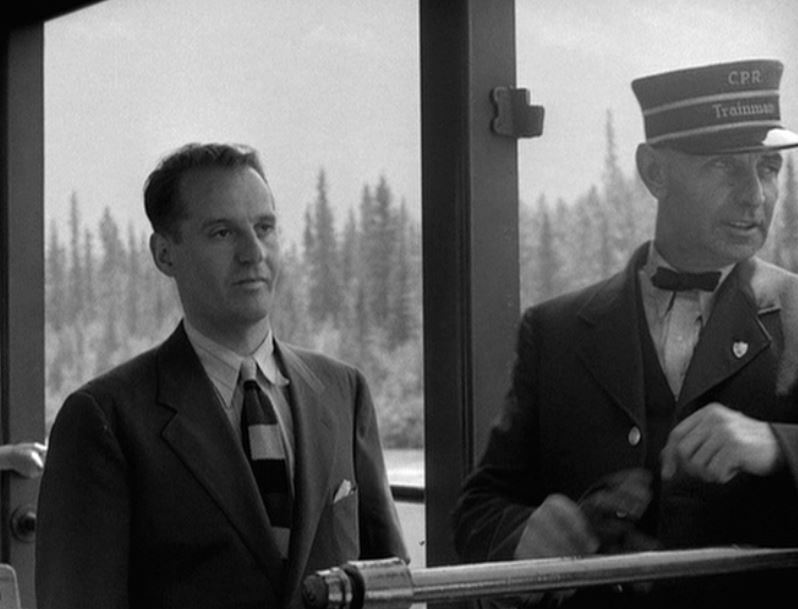 The conductor thought that Hirth was acting a little hinky and alerts the Mounties. 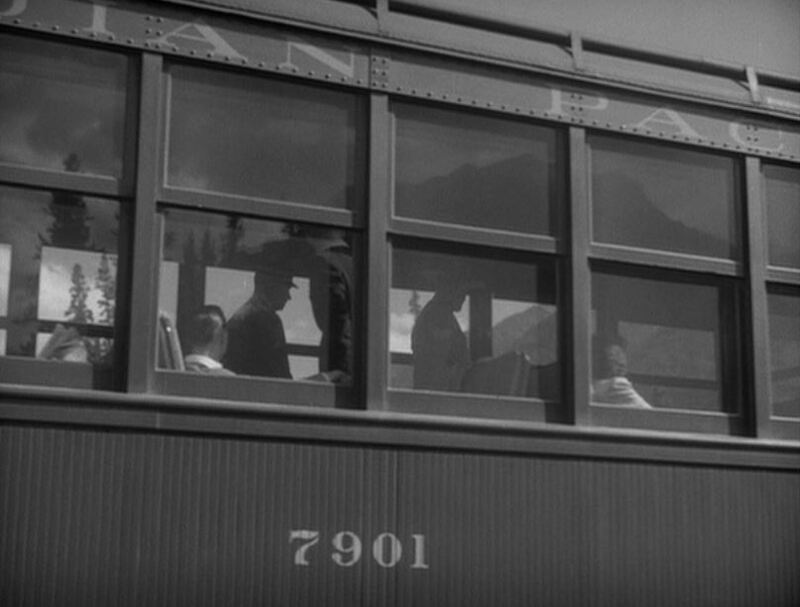 From the outside, we get a close up view of the open-air observation car #7901. 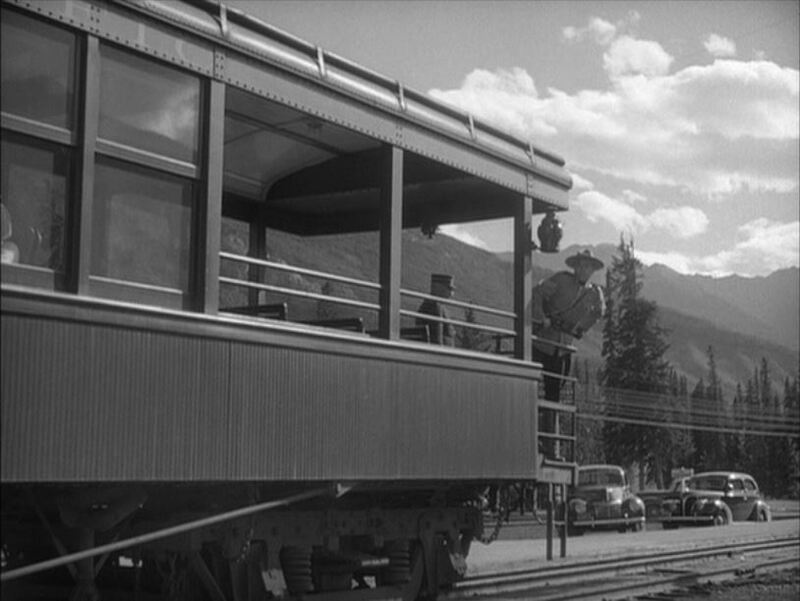 Check those old cars behind the train! The jig is up! 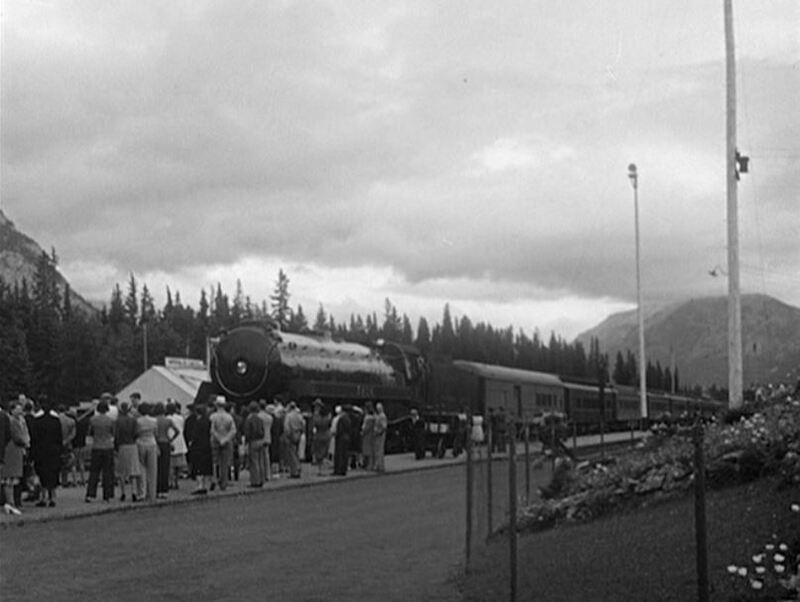 An RCMP sergeant addresses a crowd at CP’s Banff Springs hotel (note the nice, old lady on the left looking happily and directly into the camera. Despite being told NOT to…). 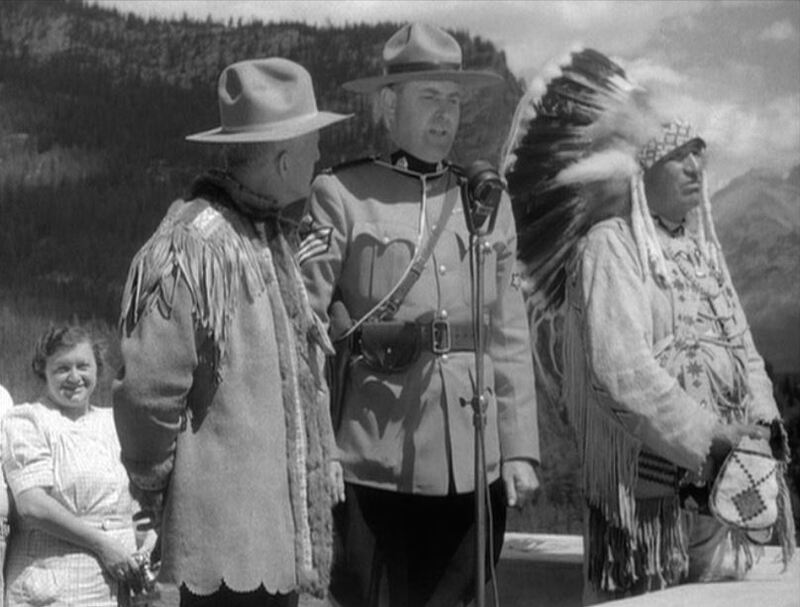 The Mountie tells the crowd there are Nazis about and has everyone look around. 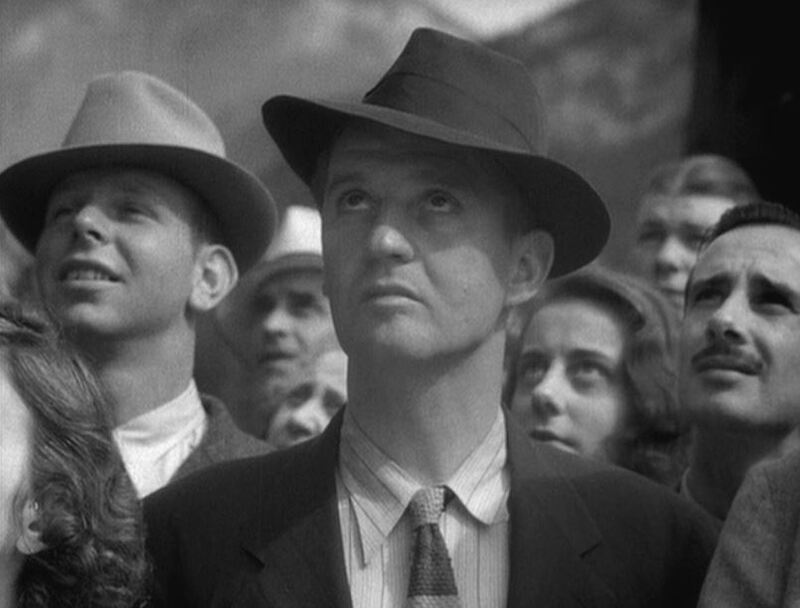 In the crowd below, Hirth keeps his best poker face in place. 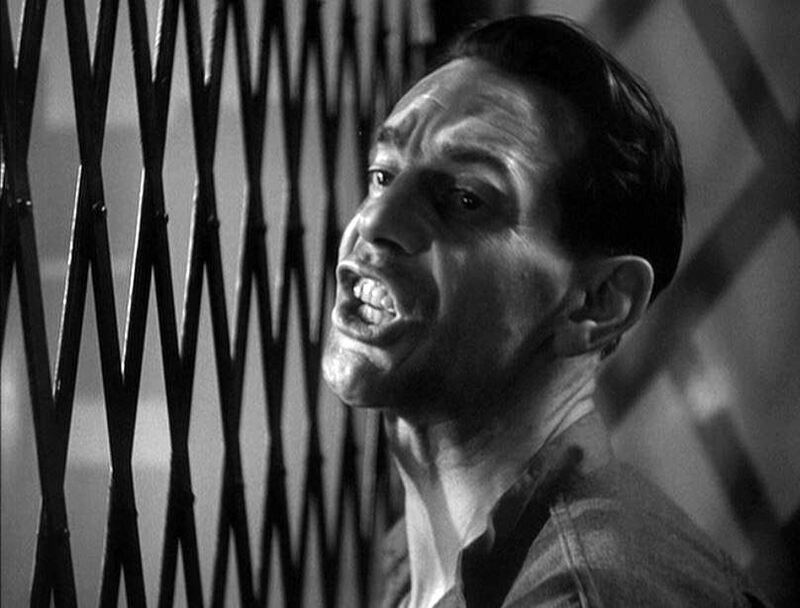 A good 20 minutes of plot left off HERE. 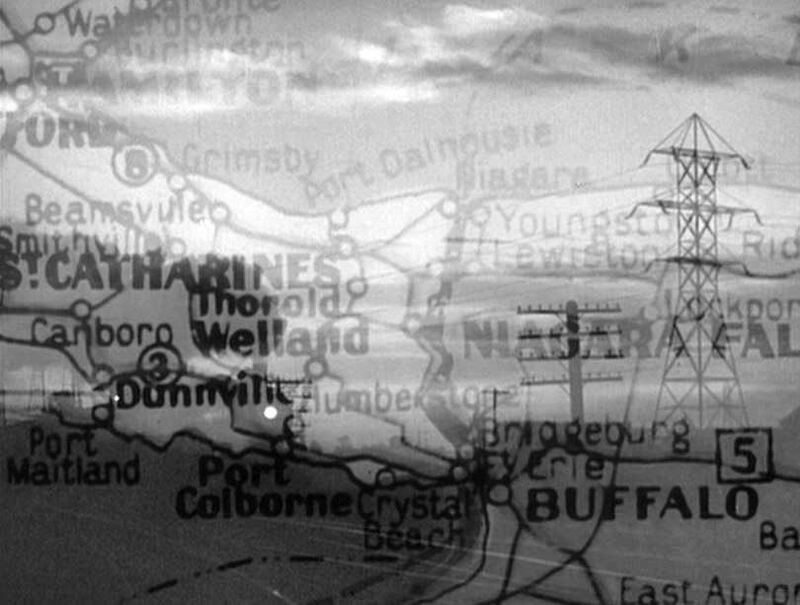 Montage of the final and climactic scenes occur on the CNR/GTW Railways near Niagara Falls, Ontario; A steam train trundles along as it nears the border. 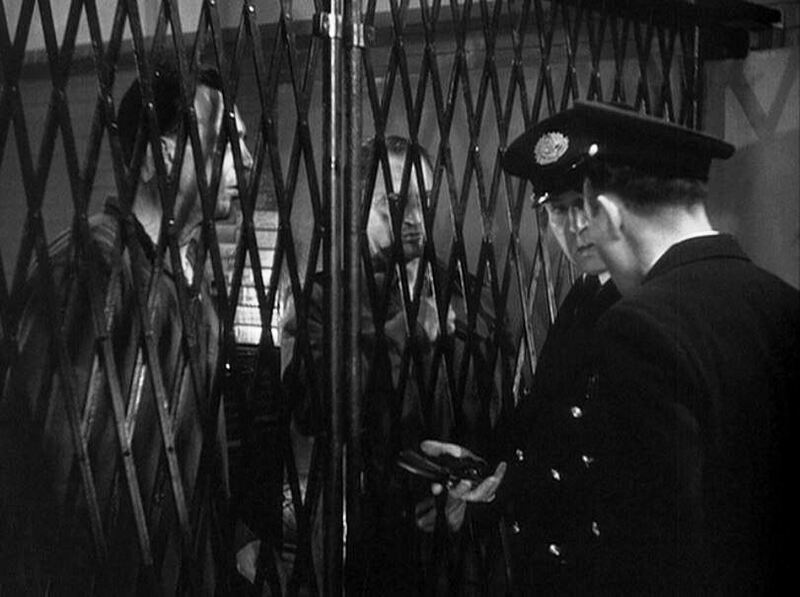 Symbolically “behind bars”, Hirsh has stowed away in the baggage car; Raymond Massey (as AWOL Canadian soldier Andy Brock) meets Hirsh for the first time. 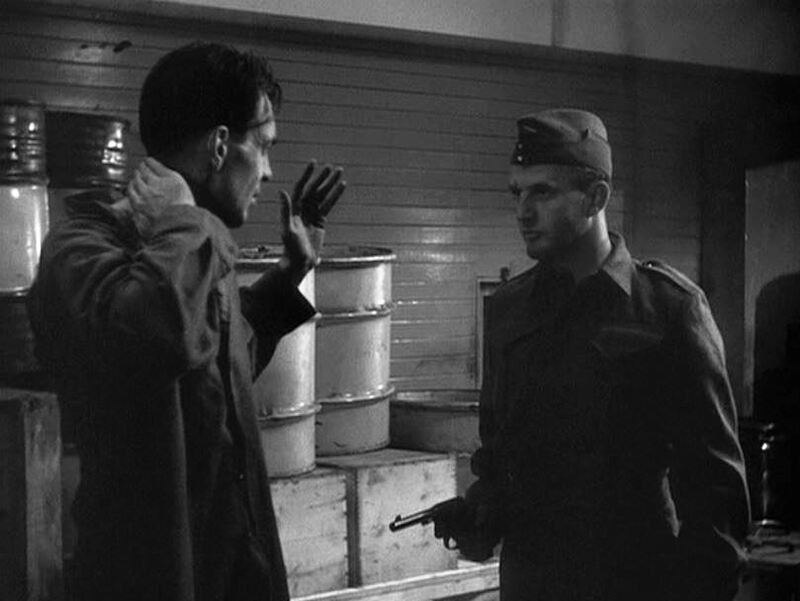 Canadian soldiers detrain as Hirsh and Brock shoot the breeze. Ouch! Hirsh clobbers Brock and steals his Canadian uniform; Brock sasses the kraut lieutenant, who he now recognizes from the newspaper headlines. 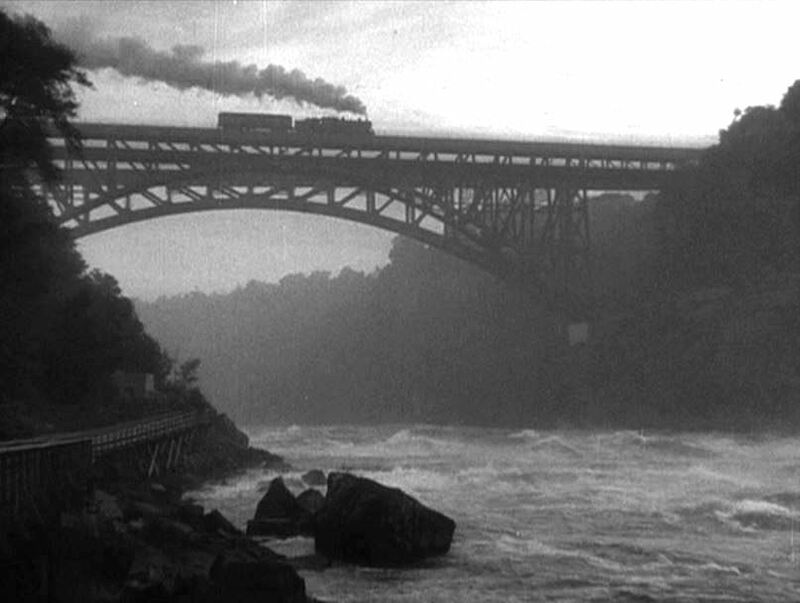 As Hirsh holds Brock at bay, the train arrives at Niagara Falls, Ontario. 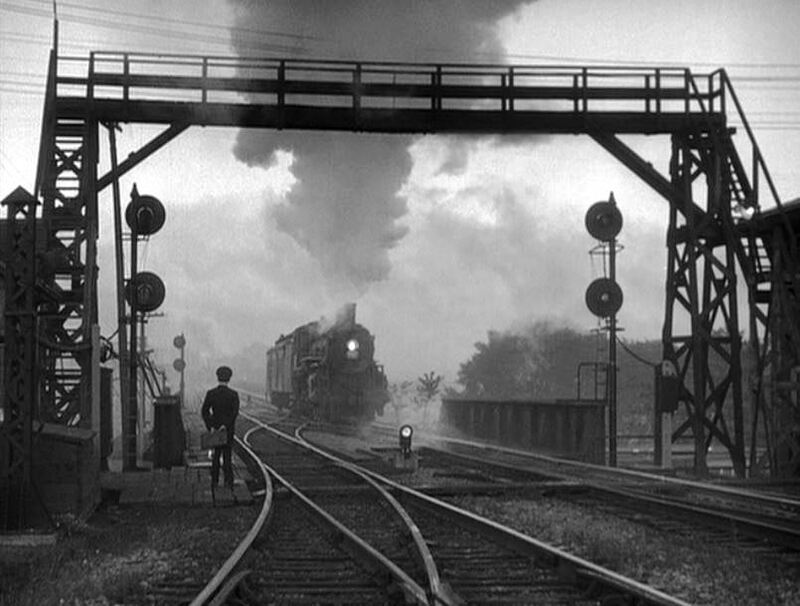 The spiffy little GTW steamer is #5607, a K-3-d class 4-6-2 built in 1911. 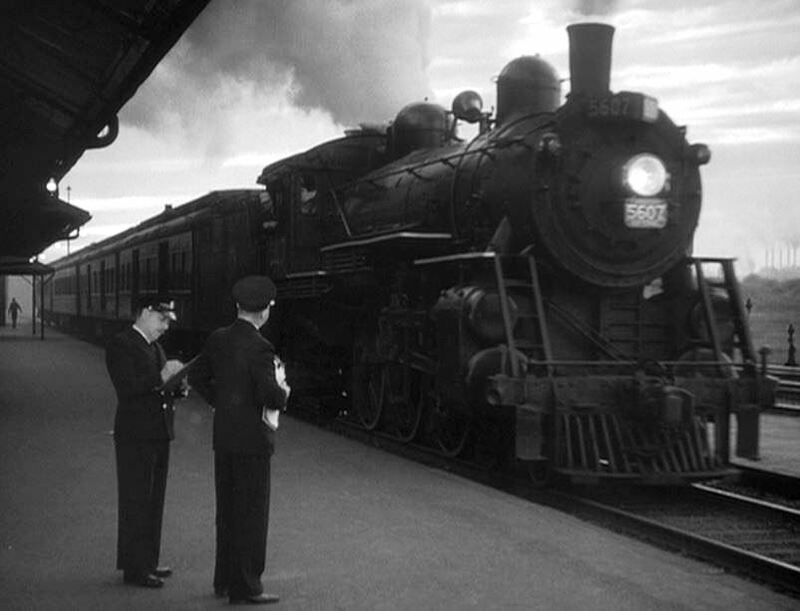 At the platform, the train is uncoupled between the baggage car and the first coach; Next we see the short train rolling over the Niagara River into the U.S.
Now in the States, GTW #5607 comes to a halt as U.S. Customs officials wait to board. 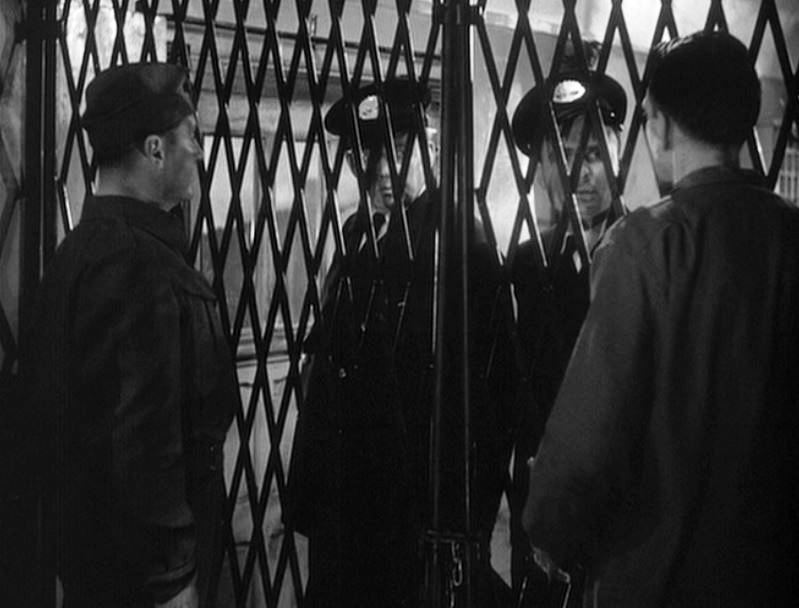 The officials board the baggage car and come face to face with Brock and Hirsh. 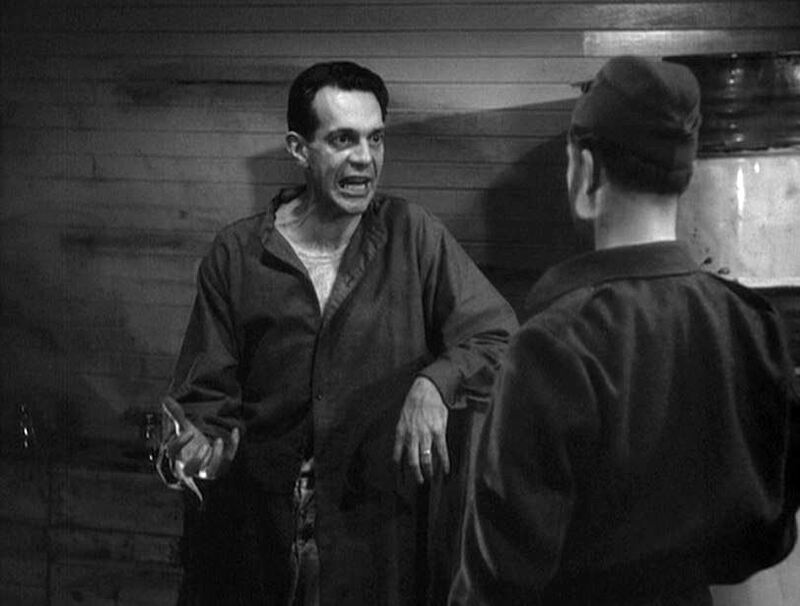 Lt. Hirsh then turns over his gun and loudly demands asylum in the still-neutral U.S.! 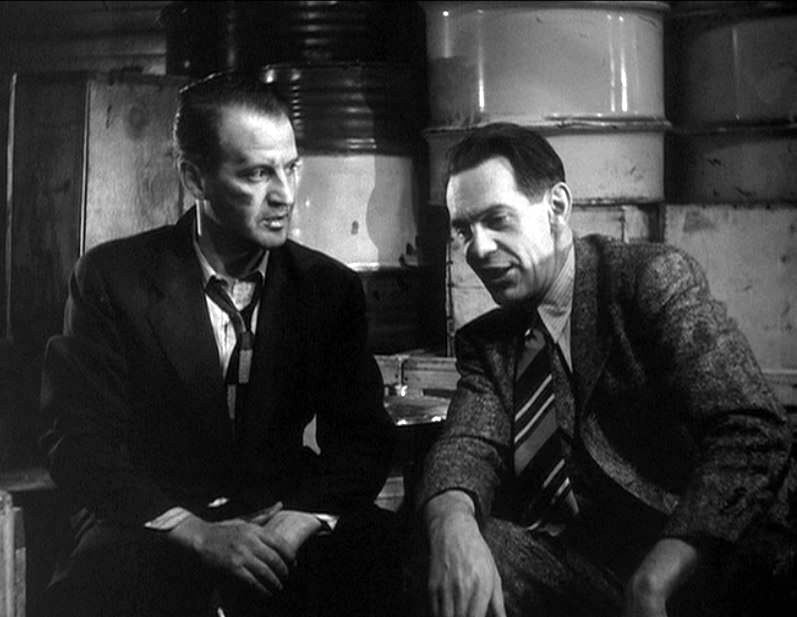 ; One of the things I enjoy about Raymond Massey is the wonderfully-sinister faces he makes — check him out some time in “Arsenic and Old Lace“. 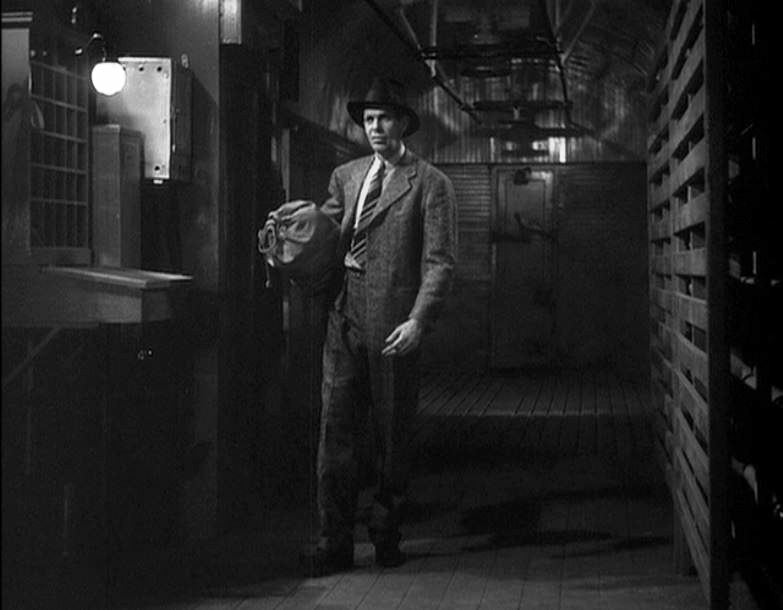 Brock convinces the Customs guys that Hirsh is “an illegal shipment of cheese” (not on their manifest) and should be shipped back to Canada. 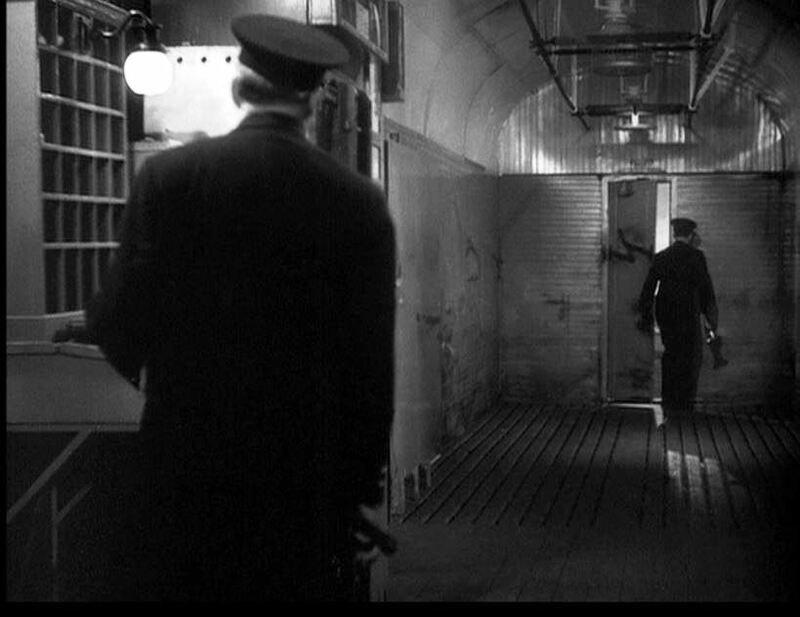 The officials agree (as neither of them particularly like the German’s attitude) and they trudge off to make their report. With another great facial contortion, Brock relishes the thought of administering some Canadian frontier justice to the now unarmed Hirsh. 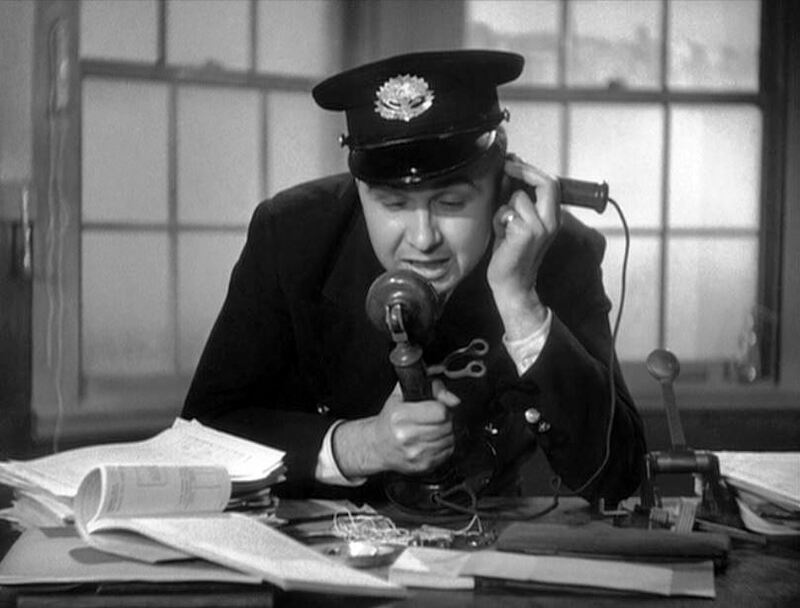 Sure enough, one of the Customs guys gets on the blower and calls his opposite number in Ontario. 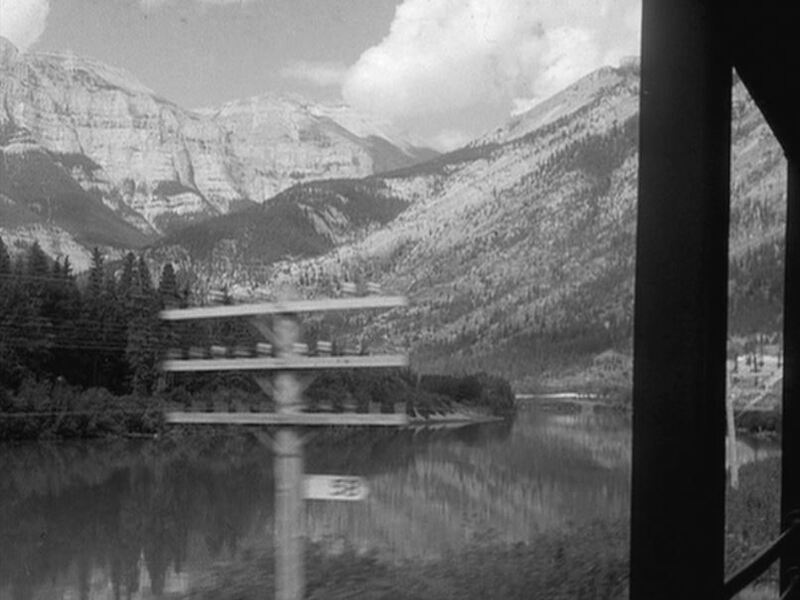 The train is then seen backing towards the Great White North. 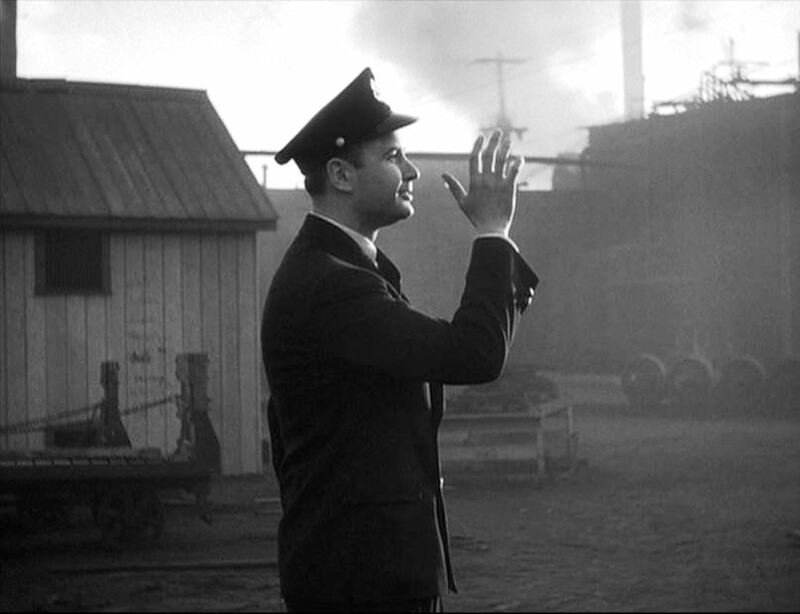 As the train trudges out of sight, the official quickly thumbs his nose at the departing miscreants. 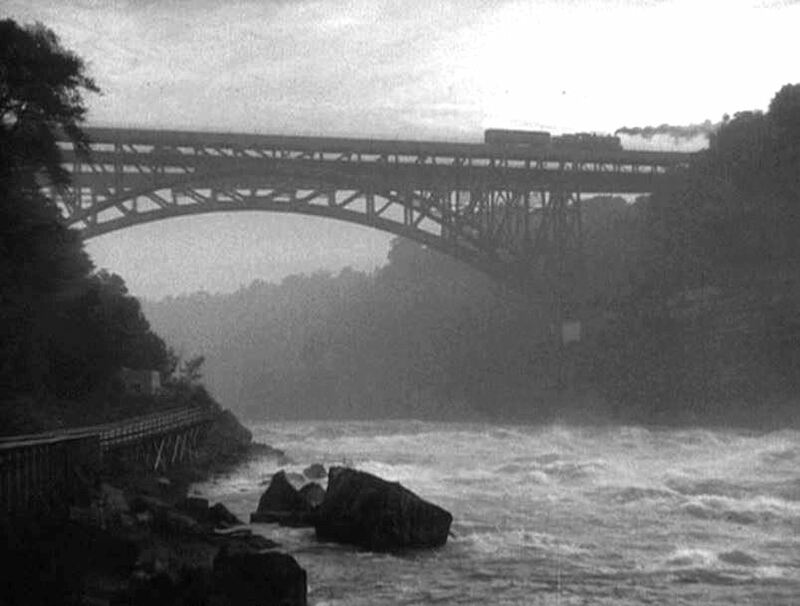 The train continues backing over the Niagara River (note the smoke direction) as the credits roll. 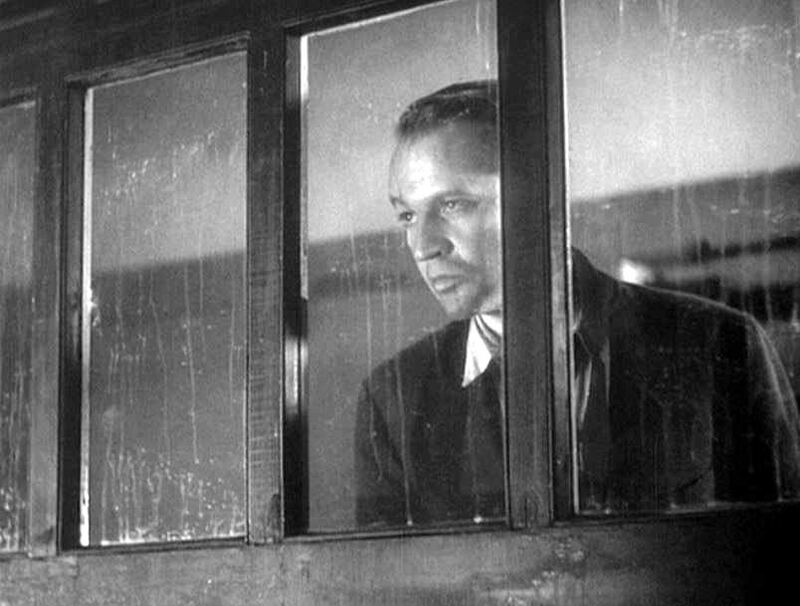 My review leaves off a great deal of the movie as I only intended to review the railroad scenes. As a whole, this is a most enjoyable picture and a historical snapshot of when Canada was at war and the U.S. was not. 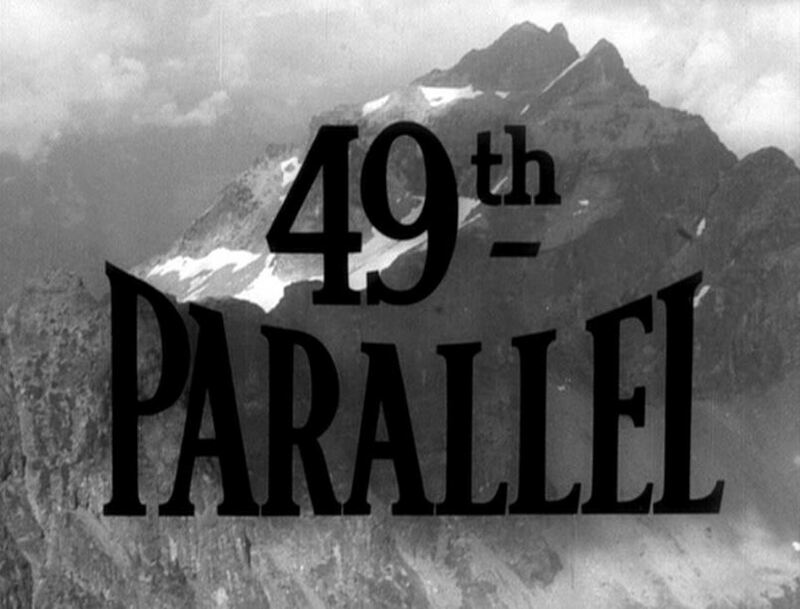 History (and train) buffs will enjoy an evening above the 49th Parallel! 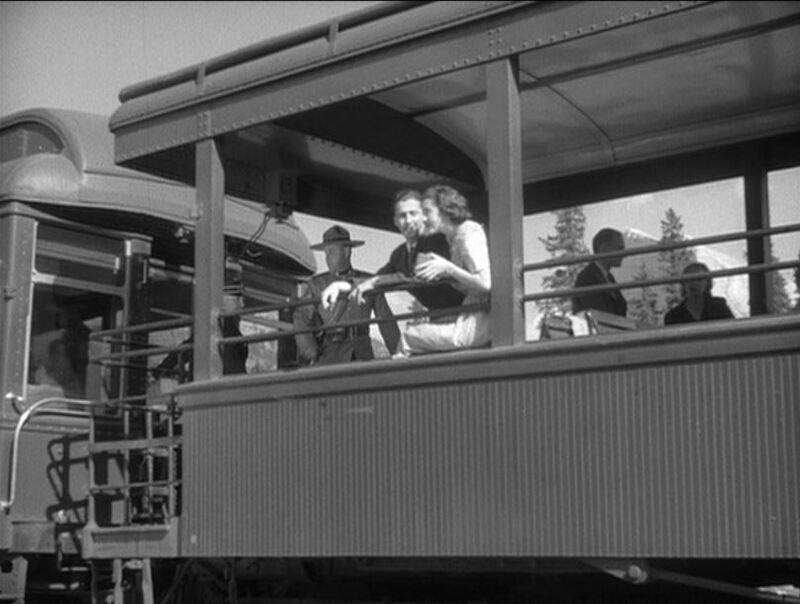 This entry was posted in Uncategorized and tagged 49th Parallel, Alberta, Banff National Park, Canada, Canadian National Railway, Canadian Pacific Railway, Canadian Rockies, Eric Portman, General Film Distributors Ltd., Grand Trunk Western, Laurence Olivier, Leslie Howard, Niagara Falls, Ontario, Ortus Films, Raymond Massey, Royal Canadian Mounted Police, Steam Locomotive, Winnipeg. Bookmark the permalink.